At the end of 1860 or start of 1861 new stamps were issued for the Austrian Empire, which, like the previous issue, showed a silhouette of the head of the Emperor Franz Josef wearing a laurel wreath crown, but this time turned to right and embedded in a coloured oval on a white background: “Head of Franz Joseph to right in oval”. 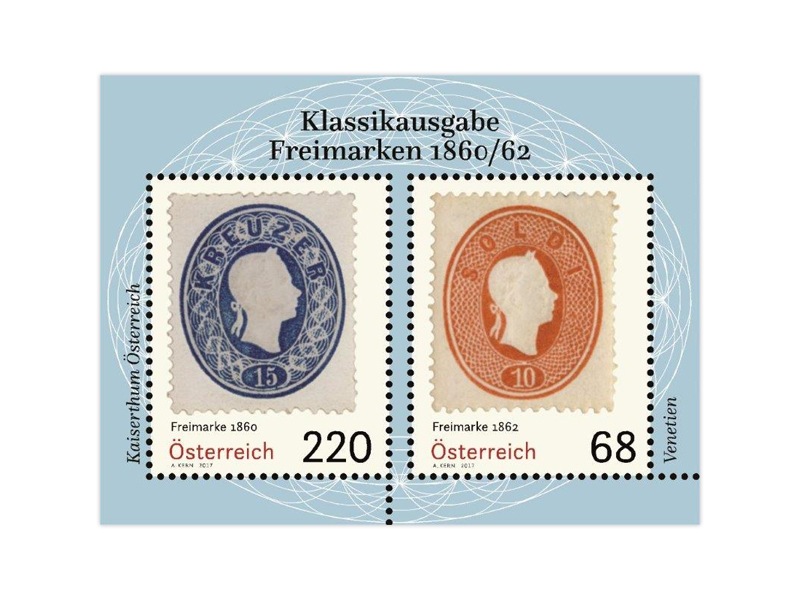 Austrian Post is now presenting these stamps as part of the “Classic Editions” series. That new stamps were issued after just two years, a relatively short period, is almost certainly linked to the fact that in 1861 envelopes with imprinted stamps were introduced for the first time. After trying a few print samples, the final design which was approved for these was a portrait of the Emperor in an oval frame. In order to give the postage stamps and imprinted stamps a uniform appearance, it was decided that this design should also be applied to the postage stamps. The new embossing dies were engraved by the experienced engraver Tautenhayn. The coloured oval frames for the imperial portrait have an intricate geometric design which is different for the Soldi denominations than for the Austrian Kreuzer denominations. This issue also included some stamps for the Kingdom of Lombardy-Venetia although, since Lombardy had ceased to belong to the Austrian Empire in 1859 and was now a part of France, the stamps were only valid for Venetia. Since it offered greater protection against the risk of forgeries, the new stamp issue was relief printed, had no watermark, was gummed and had sheet or harrow perforations. In the Austrian part of the Empire it was issued in denominations of 2 Kreuzer (yellow), 3 Kreuzer (green), 5 Kreuzer (red), 10 Kreuzer (brown) and 15 Kreuzer (blue). The Soldi denominations for Venetia were only issued later: in June 1861, a denomination of 5 Soldi (red), and in June 1862, 10 Soldi (reddish-brown). The other Soldi denominations were not issued since large quantities of the relevant Soldi stamps from 1858 were still available as a result of the loss of Lombardy. The denominations of the new stamp series were printed in a white font on a coloured oval plaque below the Emperor’s portrait; the currency Kreuzer or Soldi was incorporated into the frame above the Emperor’s head. For these stamps too there are a range of shades of colour and different perforations to be found. However, in contrast to the previous issue of 1858, they are not classified as different types. The stamps were valid for franking until 31st May 1864. The current mini sheet shows a 15 Kreuzer Austrian stamp and a Soldi stamp with a denomination of 10 Soldi. They are set against a light blue background in an oval frame showing an ornamental design in the style of the Austrian stamps.